As a diver I enjoy the marine environment a lot and while some dives may be focused on practicing skills it seemed a waste to just go diving and not record anything about what I had seen. It is always a steep learning curve with the marine environment because there are so many factors to take into account, from pollution causing changes in the smallest of species to the destruction one ship can cause if it slips anchor as well as the many different species and geological formations. Seasearch is a way for all divers to help keep an eye on the marine life and habitat which we are privileged to explore each time we get in the water and to learn more about what they see. During the 1980’s it was recognised that recreational divers were a great resource for data collection on the marine environment by Dr. Bob Earll and Dr. Roger Mitchell and since then Seasearch has been developed so that it isn’t just specific areas monitored but with the training through one of the many centres around the UK run by the Marine Conservation Society (and others) to create a year by year map that shows the overall condition of species, species migration and if we are having any effect on their habitat and numbers. To raise public awareness of the diversity of marine life and habitats in Britain and Ireland through the dissemination of information gathered and the identification of issues arising from it. There are two levels to the Seasearch program, Observer and Surveyor, the first level of Observer is more important than it sounds with the experience and skill-set it gives to understand the marine environment when diving and has to be taken first to give you the chance to learn more about the recording techniques, the second level of Surveyor is a little more in-depth and at the moment for me sounds more like another degree. As I am in Cornwall I will be taking part in the next course which is to be held on April 6th and 7th and the cost is the same as a good quality mask, £40 covers 2 days, one in the classroom to learn about the observer forms and some basic species identification and geological environment and the second day is a dive to put it all in practice. One of the conditions is that you have insurance but it is not as bad as it sounds, as I am only diving in the UK at present I will be purchasing the Divemaster public liability cover which is only £20, if I was diving abroad then I would go for DAN insurance to insure myself against any accidents as well as to cover me for Seasearch. The data I collect will be added to the Seasearch map that is open to all to view and use and I will also be using it to update the dive site information here on divingjunkie.com as we explore new places and record them for your information. It is almost that time of year when Scubafest 2013 is upon us here in Cornwall, it will be hosted at Pentewan Sands Holiday Park with dive sites around Cornwall for all levels. There will be live music and entertainment during the day and evening at the holiday park so contact them now on 01726 843485 or 01539 729048 at Bluestone Events Ltd to book your place. The weekend starts on Friday 3rd May through to the 6th and all the dive companies around Cornwall are taking part with some of their favourite dive spots during the day and night. They unfortunately had to cancel it last year but this year it will be different because we have to reach as many divers (and non-divers, dive widows, dive widowers) now to get them to come along and see what Cornwall has to offer. This year the many dive sites include (links are to videos) Pentewan Beach, Newquay Headland, Mevagissey and more exciting places they have in store for us. So if you are an absolute beginner that wants to try a dive or an aged expert that has never been diving in Cornwall before get in touch with them and book your place now. Evening of Friday 3rd Headlining act is Midriff a Cornish group from St Austell with some of their own music as well as their unique versions of covers to start the weekend and party the night away. The fancy dress theme for the Saturday is Star Wars and there will be many Jedi spreading the good will of the force. Running on Saturday 4th May. Entry is free and open to all. You can register between 6pm and 10pm on the Friday evening in the Pentewan Sands Holiday Park clubhouse. Good luck with your happy snapping. Oceanic released this snorkel a while ago and it is very simplistic in its design, the attachment clip to the mask is robust and easy to clip on and off the mask. The great thing about it is that as a spare snorkel it folds up easily and can be squeezed into a pocket. 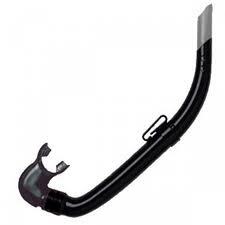 They have recently replaced it with the Enzo snorkel but it is the same thing with a black end piece and new name. Now to be fair it isn’t anything special, just a tube with mouth piece connected and shaped as can be seen to fit round the side of your head; yet that is the beauty of a snorkel as sometimes trying to be something it isn’t makes things over complicated. The Oceanic Blast Snorkel does exactly what it is meant to, be a breathing tube when you are on the surface and unlike many others if you do purchase one of these at less than £7 (approx US$10-15) it will be perfect as either your main snorkel or a back up. There is no guard to stop water getting in the top (most of these never work properly anyway) and no clearing valve at the base, it is an ideal and cheap first snorkel and is made out of such a tough material that it should last you till you decide to give up diving.